It is 80 years since the Spanish Civil War broke out. 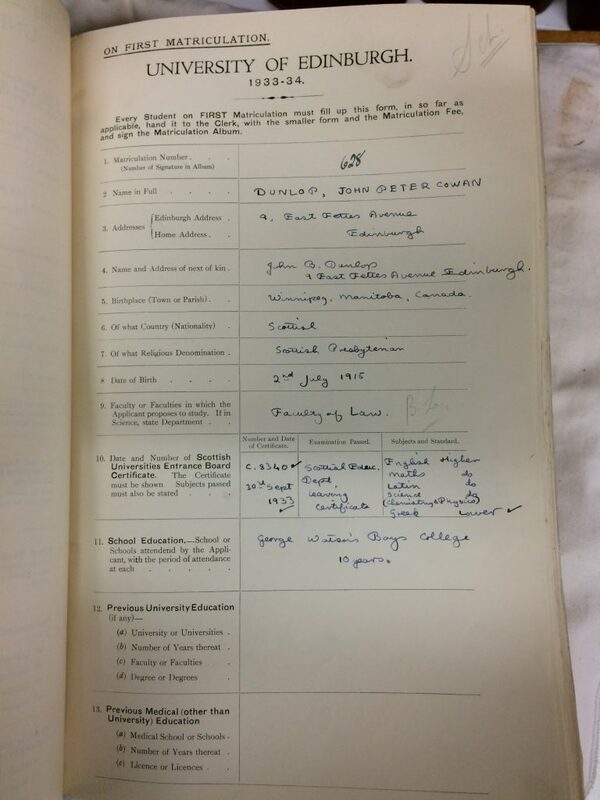 Unlike both World Wars, we have no record of University of Edinburgh students who fought (and died) in Spain and this is the start of a process of trying to identify who did. This is very much work-in-progress and will be updated as we find additional information. 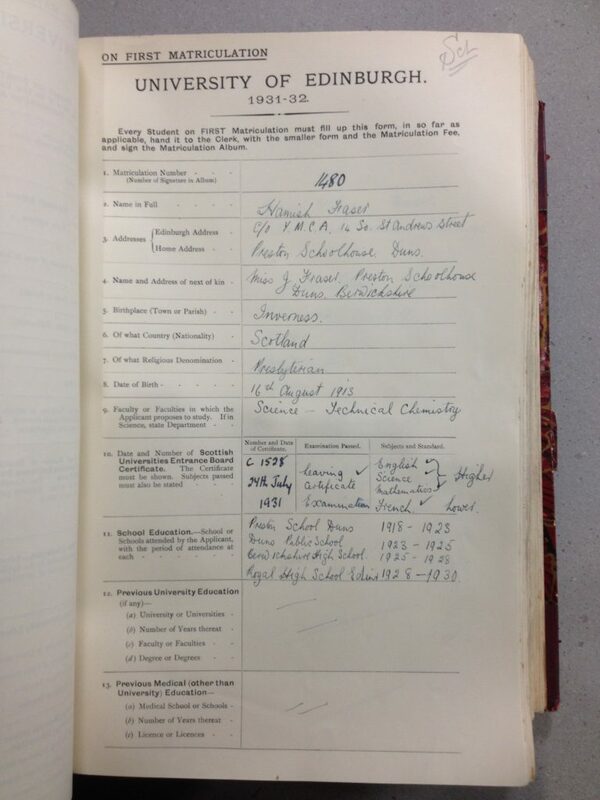 George was born 31 March 1910 in Leith, the son of George Drever and Louisa (Balfour). 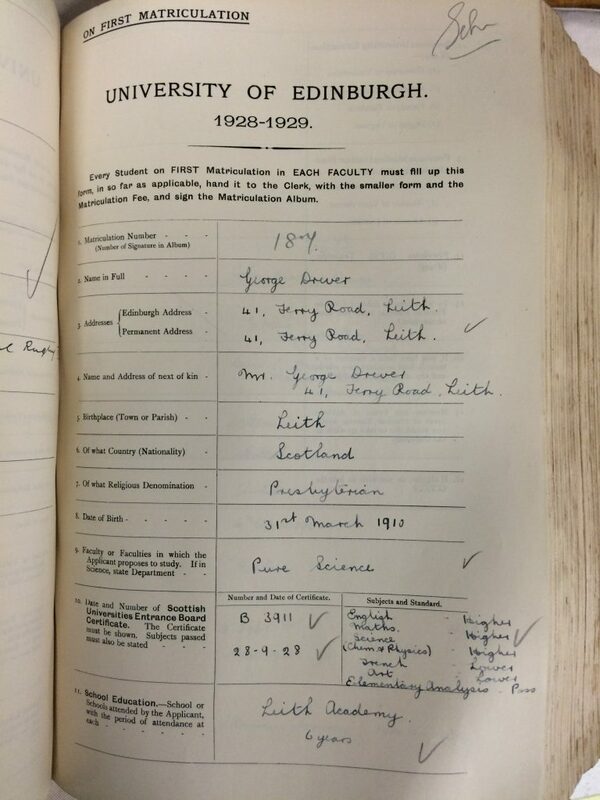 He spent 6 years at Leith Academy before enrolling to study Science at the University of Edinburgh, gaining a First Class Honours BSc in Pure Science in 1933. Two years later he was awarded a PhD, his thesis being, Electrochemical studies in oxide formation on some metals. 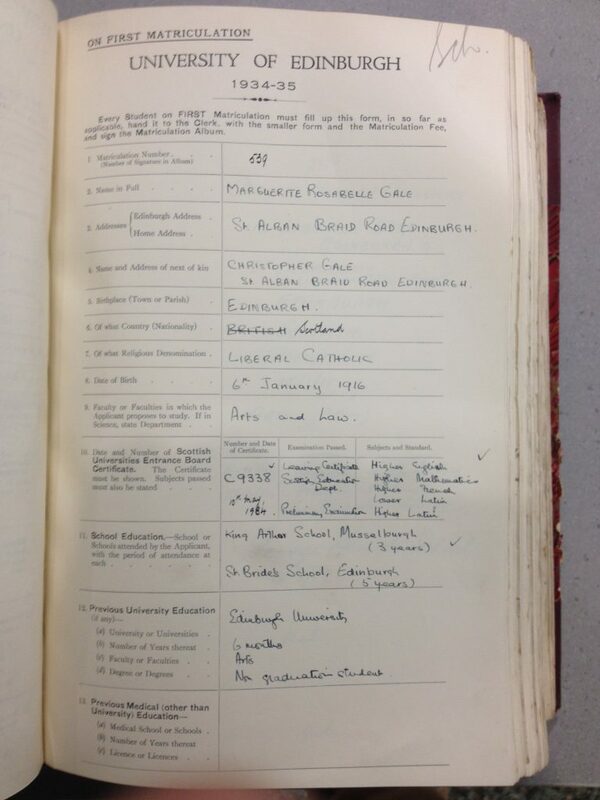 A more detailed biography can be found on the Chess Scotland website. Frances was born 12 May 1914 in Southampton. She was educated at Falmouth High School then at Blackpool Girls’ Secondary, enrolling to study medicine at the University of Edinburgh in 1932 and graduating MBChB in 1937. She was a member of the International Students’ delegation and one of six students in the British delegation of the (strongly Communist) World Student Association who visited Spain in the 1936/7 Christmas vacation and campaigned for the Republicans on her return. Born 2nd July 1915 in Winnipeg, Canada, John was an accountancy student (non-graduating). Born: 2/7/1915, Winnipeg, Canada. Enlistment Address; 9 East Fettes Avenue, Edinburgh University Accountancy student. CPGB (1936) OTC in England. Single. Age 22. Arrived in Spain 19/5/1937. Enlisted in Battalion 22/5/1937. Joined the British Anti Tank-Gun Battery. Action’s participated in: Jarama, Brunete, Teruel, Belchite, Ebro. Wounded at Brunete in July 1937, (between the 6th and 12th) by shrapnel in the back. Recovered in hospital at Barcelona. Joined British Battalion on 10/11/1937. Wounded on 20/1/1938. In Hospital February-April 1938. Rifle No; 98101. No. 4 Company, Section 2, platoon 2. Confirmed Corporal on 30/4/1938. Sergeant. Wounded during the Ebro Offensive on 31/7/1938. In hospital 3/10/1938? Invalided home in October 1938. Set up his own printing business in Edinburgh upon his return. He later became accountant to the International Brigade Association. His entry on the International Brigades website. His papers are held by the National Library of Scotland: He died in 2006. Hamish was born 16 August 1913 in Inverness. He was educated at Preston School, Duns, Duns Public School, Berwickshire High School and at the Royal High School, Edinburgh. In 1931/2, he enrolled at the University of Edinburgh to study Technical Chemistry. The fact that his record specifies the subject rather than, as was the norm, simply recording the Faculty, suggests he was not enrolled in a full degree programme. Margot was born in 1916. She was educated at King Arthur School, Musselburgh and St. Bride School, Edinburgh, enrolling at the Univerity of Edinburgh in 1934. While at University, she served as President of the Women’s Union, 1937-38. She graduated MA in 1938. In August 1938, she joined the Young Communist League. She was mother of Guardian journalist Martin Kettle. His full name was William David Beveridge Mackenzie and he was born 14 November 1916, the son of Rear Admiral W. B. Mackenzie, in Rock, Cornwall. He was educated at Copthorne School, Sussex and at Marlborough College. He enrolled as a summer term only medical student at the University of Edinburgh in 1935, having previously studied history at Oxford. c/o 16 King Street, London. (CPGB HQ) Oxford University. 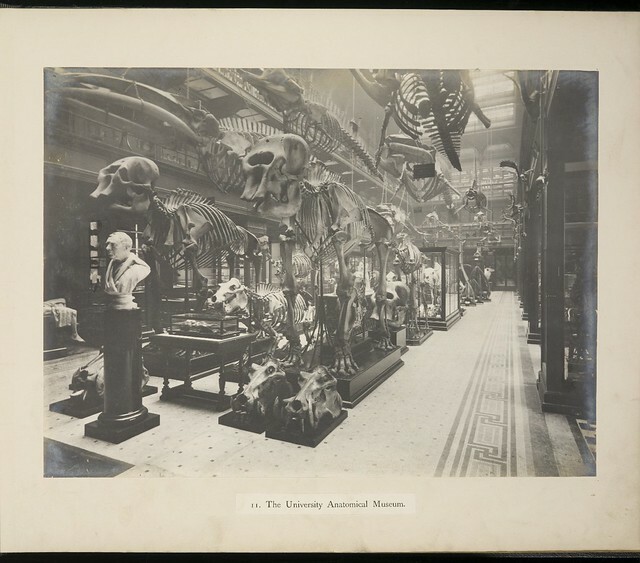 (History & Law) Medical Student at Edinburgh University. YCL. CPGB. Age: 20. Spain, 09/10/1936. French Commune de Paris Battalion, (Dumont Battalion) 11th International Brigade. Reported killed in error (25/11/1936) at the University City, Madrid, in the Daily Worker dated 05/12/1936. 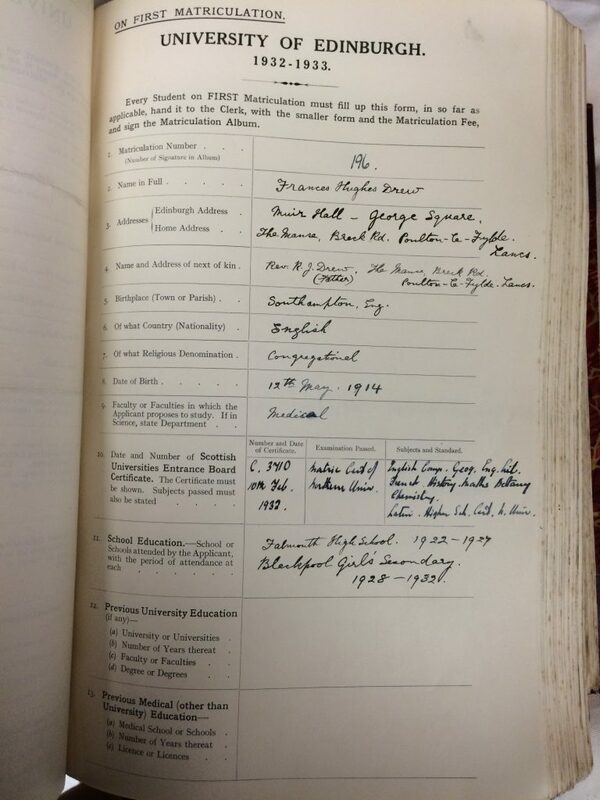 Returned to UK on 05/01/1937. (V.11 37a PF 45600) Battalion No. 947. I am very grateful to a number of people who have provided various leads on this subject, particularly Mike Arnott and Fraser Raeburn and of the Scotland and the Spanish Civil War Facebook Group. 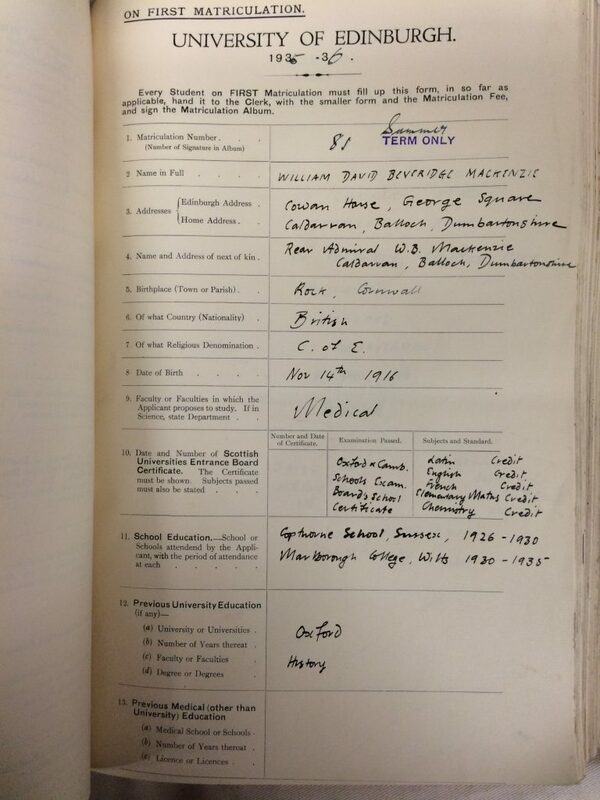 This entry was posted in Collections and tagged alumni, Spanish Civil War, students on 09/12/2016 by Grant Buttars.